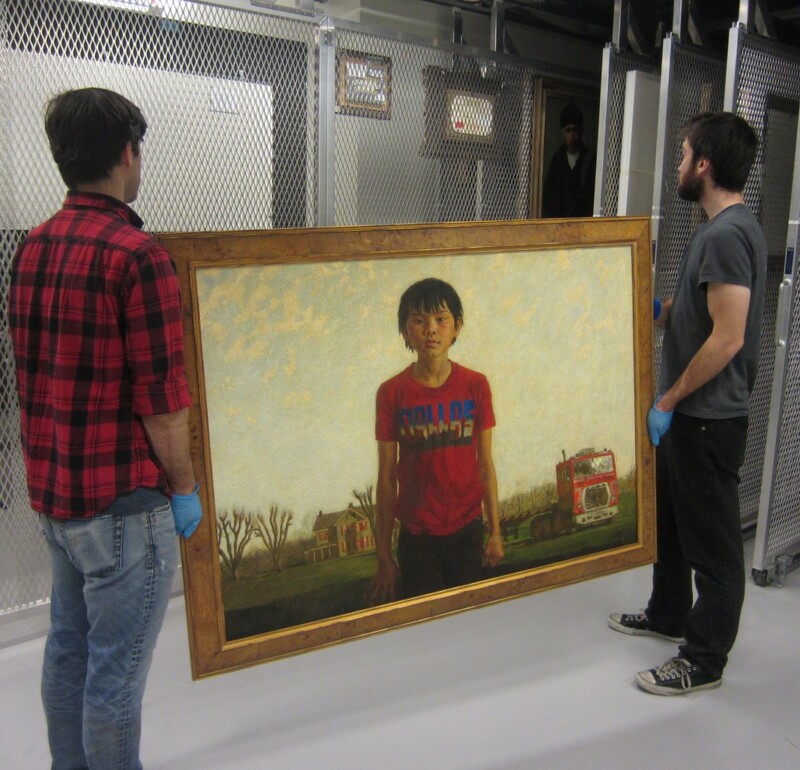 Storage view of Jamie Wyeth’s 1986 painting Kalounna in Frogtown from the Terra Foundation collection. Through loans from our collection, the Terra Foundation for American Art contributes to exhibitions and programs that enhance the scholarship and understanding of American art. Institutions seeking to borrow objects in the collection must send a formal letter of request. See the section below on Loans for details. The Terra Foundation encourages the fair use of the contents of this website. Use of certain images of works in the foundation’s collection may require permission by a third party copyright holder. Academic fair use of images of works in the collection is encouraged. Commercial uses of the collection images require licensing, see Permissions below. Many images of works in the Terra Foundation collection are available for download for academic use from the Terra Foundation website. If a downloadable image is available, the download link appears beneath the image, alongside the essential caption and credit line. The Terra Foundation asks that the provided caption and credit line be used in all academic uses. Images may be browsed online and browsed by artist, medium , date, and keyword. Guidelines for Academic Fair use have been set forth by American Alliance of Museums and College Art Association. As an end user, you are solely responsible for the download or use if any images from the Terra Foundation site. It is your responsibility to verify or to accept any rights information provided as well as to obtain any additional permission or clearances that may be required for works protected by copyright or third party. The Terra Foundation also makes images available through the ArtStor Digital Library. For information on ArtStor access and accounts, please visit their website. Access to ArtStor may be provided by your academic institution. Museums, scholars, and non-profits are encouraged to request permission using the contact information detailed below, in order to receive high quality images suitable for publication. To request digital files in sizes or formats beyond those offered for download, please see Permissions below. Institutions seeking to borrow objects in the collection must send a formal letter of request addressed to Terra Foundation President & CEO Elizabeth Glassman. A list of the objects requested. A facilities report from the borrowing institution and all venues must be submitted for review before the loan can be presented to the foundation’s Board of Directors for approval. Requests for artwork from the collection on loan to the Art Institute of Chicago must be submitted at least 12 months before the opening of the exhibition. To see objects from the collection on loan to the Art Institute, please follow this link. Please also include the publisher’s name and the physical mailing address of the publisher. Use of the foundation’s images require licensing through our agent, Art Resource. Licensing is limited to the specific permissions granted by contract, and any use outside the terms of the license will constitute a breach of contract. Copyright for certain images and works of art in the Terra Foundation collection may be held by a third party, such as an artist’s estate or artist groups, in addition to the Terra Foundation. Artists in the our collection represented by a third party include Alexander Archipenko, Milton Avery, Romare Bearden, Thomas Hart Benton, Paul Cadmus, Stuart Davis, Fritz Eichenberg, Lyonel Feininger, Arshile Gorky, Stanley William Hayter, Rockwell Kent, Yasuo Kuniyoshi, Paul Landacre, Jacob Lawrence, John Marin, Reginald Marsh, Georgia O’Keeffe, George Tooker, and Grant Wood. Reproductions of select Terra Foundation images can be purchased through 1000Museums at: www.1000museums.com/museums/terra-foundation-for-american-art.